It as been an absolutely crazy couple weeks here at SFC Design Group. We are expanding the office and have added a new designer to help with Youtube creation. Video is hot right now! This past week we worked with Captain Eric, in Erie Pennsylvania. 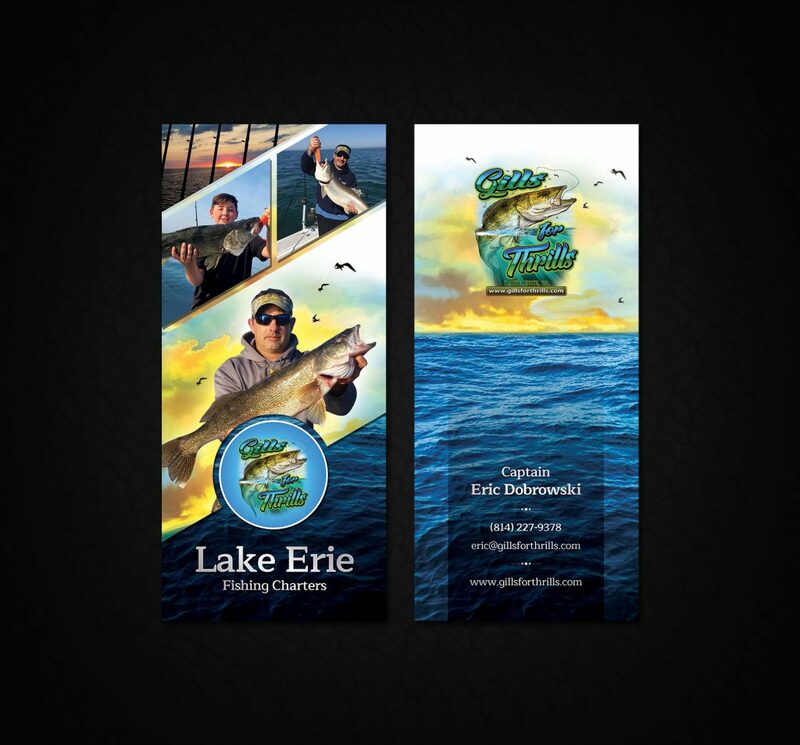 Eric had a vision of a web marketing plan that included our professional charter fishing style in a not so professional market place. It was our job to bring his ideas to production while adding our expertise along the way. Every brand starts with bringing our team and customer together including myself to determine ideas such as business names, logo illustrations, web design and print design. By having the entire team in the same room, we can bounce ideas off each other that fit like a glove during the process. So our logo developer Brian communicates with our web designer. This allows them to determine size, colors, etc that fit into the website in the next step. Our web designer Irvin, then works with our coder Victor to determine the best flow and layout of the design. All 100% custom design and hand coding. And while all this fire is going down, myself and Tim are are communicating with everyone to develop high quality copy and brand identification. We are even talking SEO and PPC at this point to ensure that we get a final product that produces when we start the digital marketing campaigns. And we want it to produce fast! 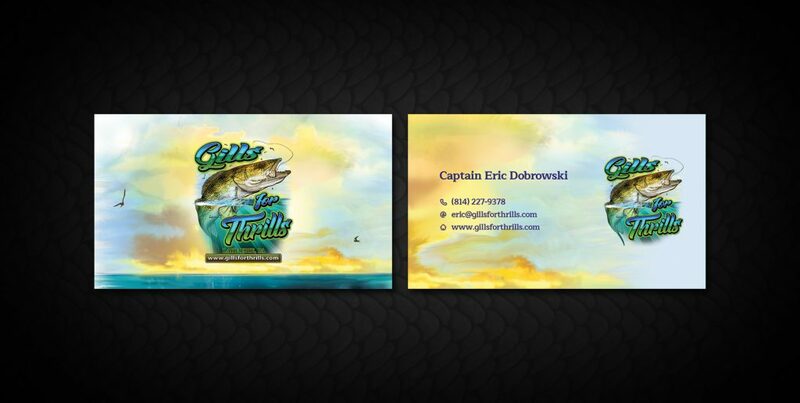 Captain Eric, a Lake ERIE walleye fishing guide gave us some great direction to produce a fun logo that will not only be featured as a big part in his website, but also his print design such as shirts, business cards and rack cards. Brian spent a lot of time getting the walleye just right, but it was time well spent. Just check out this first draft! As the logo is finalized, Brian passes it on to Irvin for the start of the custom website. Irvin is quite the surgeon in photoshop and illustrator. He goes over every pixel and is an absolute perfectionist with a great eye for design and how customers look at websites. After all, there are a ton of web designers out there, but having one that understands your business and more importantly the customer experience is a huge and the reason our guides crush it. This piece of art is ready to be framed and coded (or put on your wall). A few tweaks and it is sent to Victor’s desk to get chopped up into xhtml and a custom WordPress theme. Wordpress allows our clients to have full management of their website including updating rates, adding photos and fishing reports. And while all this is going on… We are working on business cards, rack cards, brochures and more. And the list goes on and on. We are a strong believers that with the highest quality digital marketing products, our fishing guides have a major advantage over the competition. And while a website is no more than a business card online until it is marketed, our strongest area of expertise is to drive quality leads using SEO and SEM strategies. If you are serious about your fishing guide business, I recommend you start by reading The Charter Fishing Business Kit. In this book, I give you an inside look into our secret sauce used here every day at SFC Design Group. Oops, We Did it Again – The Perfect Fishing Guide Website! When are we going to stop throwing darts at the green?! 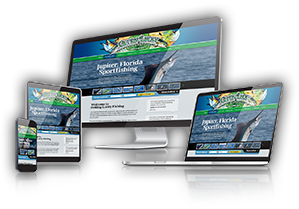 Last week we had the opportunity to revamp our long time client’s website, Strikezone Fishing. 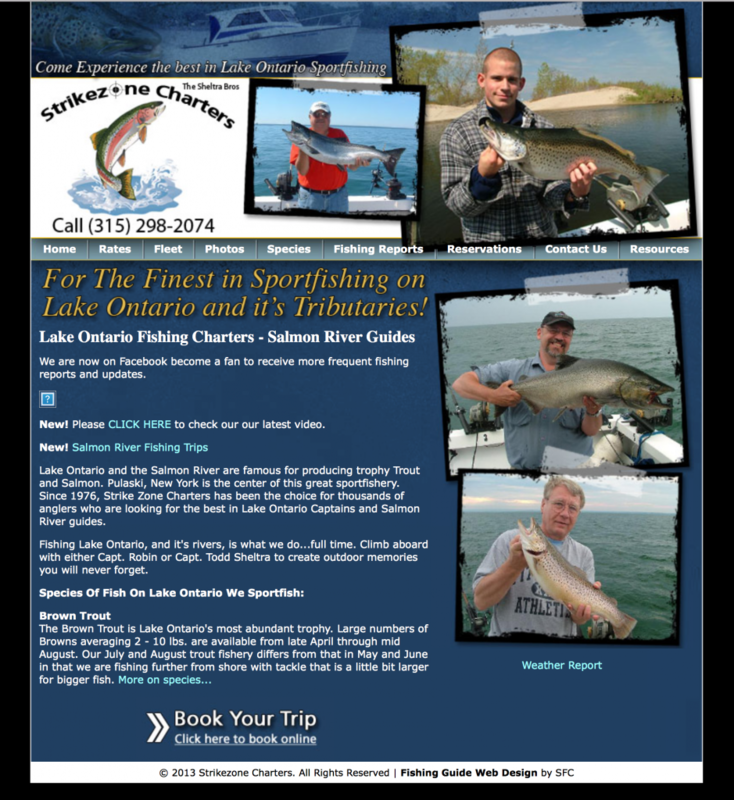 The Sheltra family has been with us for well over 10 years offering fishing charters on Lake Ontario. They have been a pleasure to work with and it was our turn to give back making sure they stay ahead of their competition. After all, we are all about ROI and this was an investment they could not afford not to make. Just check out this old website design. Not bad right for over 10 years old right? Big problem, it is not mobile friend and more than 70% of their trips are booking from mobile devices. This game is changing just about every 2 years and it was certainly time to bring their website up to date with responsiveness (mobile being priorty). As a current client we knew exactly what they needed, so we got the team together to brainstorm the perfect home page to do one thing: book charters! Using our formula and secret sauce we went into photoshop to start the wireframe (stage 1). Irvin, our lead designer absolutely nailed it on the first go around (which he usually does). You’ll notice this webpage is long. This style of web design is trending and we are seeing sky rocketing conversion rates over shorter pages. This allows the content to flow as the customer scrolls down on their mobile device or desktop computer without constantly working back to the navigation menu to find what they are looking for. You’ll notice “call to actions” such as phone numbers, email forms and carefully placed “why us” sections. All crucial in the process of getting the lead. Once presented to Todd and Robin, they gave us the go ahead to begin coding (stage 2). Each website we code is built around the major search engines as well as every size device. Victor is the drummer of our group. He is really the most talented, but doesn’t quite get the credit. He hand codes each project from scratch rather than using a template like most firms. In fact, we won’t even touch templates. We want you to present Google with clean and unique code showing the big “G” you are all in and the authority amongst the marketplace. As we neared completion of coding the custom WordPress theme, we planned a late night launch of the site and to work on the sub pages in the live environment. This allows us to get the client up faster, while also testing everything live, rather than staging the site. We decided to go back to photoshop and create a custom sub page for the “rates” and “testimonials” pages. A shorter header allows for less horizontal scrolling on these pages allowing the customer to get the information they need even faster. The finishing touch was to install a couple SEO plugins as well as sync their Facebook account with the “Fishing Reports” page. While we ask all our clients to work the blog as much as they can, some just don’t have the time. Instead, customers like Robin are very active on Facebook, so we used a plugin to pull the RSS feed onto the reports page, keeping them fully in sync. While this isn’t the search engine juice that we prefer, it is a close second and keeps the website active and takes the burden off the site owner of updating the blog frequently. Now that we have completed the website, we are working on Local SEO as well as Remarketing and Email marketing. Visit the new Strikezone Fishing here and give us a call to discuss to building the perfect fishing guide website today. Our long time client, Captain Chad Handley took our advice recently when we told him it was time for an update. So much is constantly changing in the digital marketing arena and it is our job to keep our clients far far ahead of their competition. We have such a close relationship with each of our clients that when we suggest something they usually don’t think twice and the ROI on their investment pours in immediately. Chad originally contacted us from the Charter Fishing Business kit. It was his plan to become a full time fishing guide in the Galveston Texas Bay area. We came up with a solution that was near perfect and he has been booking over 250 trips a year every since. He is living the dream and we did it all in a short period of time. As an outdoors website speciality company, we don’t use a dime of your money to test or for trail and error. We know exactly what works for your business and no one website is the same. We work with it each and everyday from all angles. 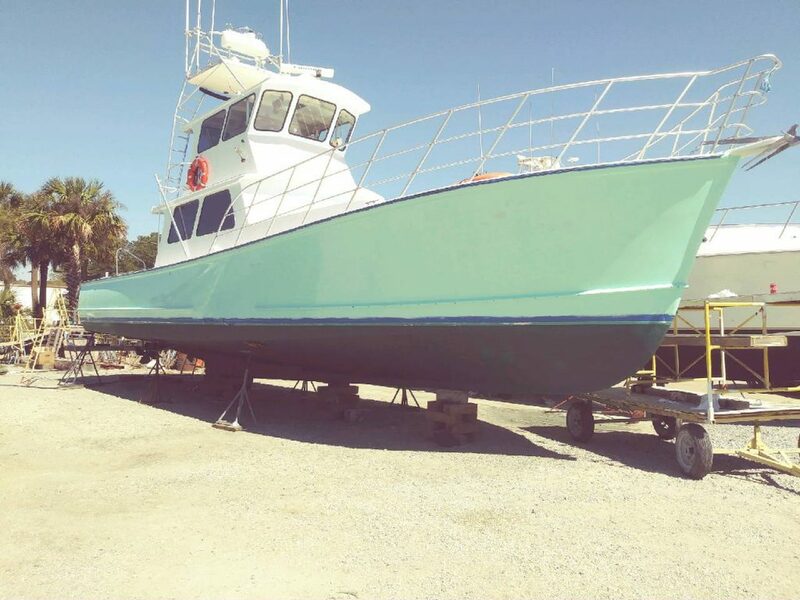 Now it was time to add that 2nd boat and since we have a close relationship into his business we understand exactly what solution he needed with responsiveness being the priority. The new website was to feature happy families, children and pure joy from customers. We want to relate to tourist and sell the exciting excursion. With big ‘call to actions’ such as Phone Numbers, Book Now Buttons, etc, we make it extremely easy on all devices to get the lead. We used his original logo which is still just awesome. Pieces of it were featured in the header and footer to make the site “fishy” and not a website that looks like anything else out there . Moving on we coded pixel perfect code that was designed to load fast, be search engine friendly, and have the ability to easily update his website in his secure WordPress admin. By adding fishing reports, photos and updates we keep the website fresh for customers to come back as well as the nightly Google. Remember repeat customers are the most valuable, so let’s be sure to market to them through web and email. I say it all the time, we have some of the best customers in the world. Talking fishing, marketing and business is never a dull conversion. 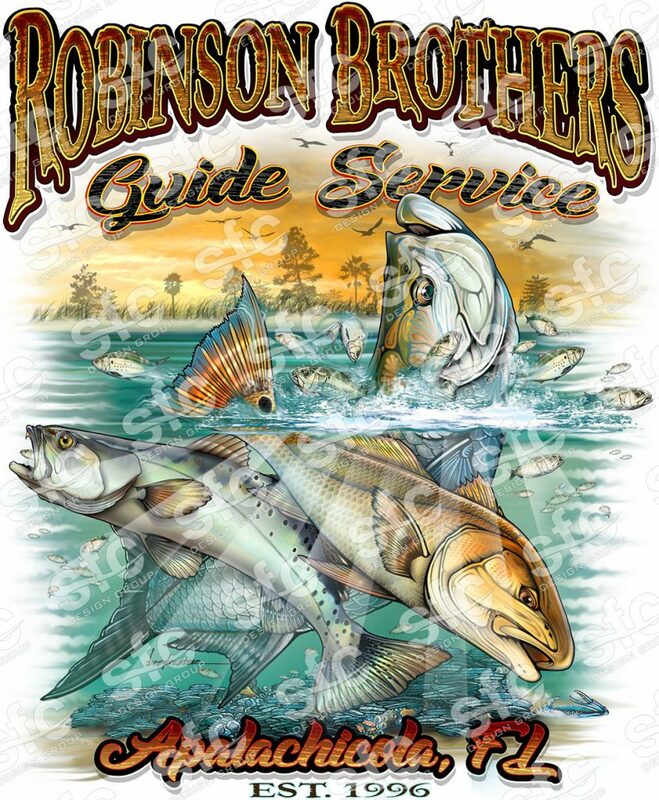 The Robinson Brothers found our graphic design style to their liking and gave us a call. The initial consultation included a wide array of ideas covering the spectrum of fishing the Apalchicola area and what it meant to them. My desk was covered with sketches and ideas from our brainstorming session. But now it was our time to turn these ideas into a brand logo that would pop. 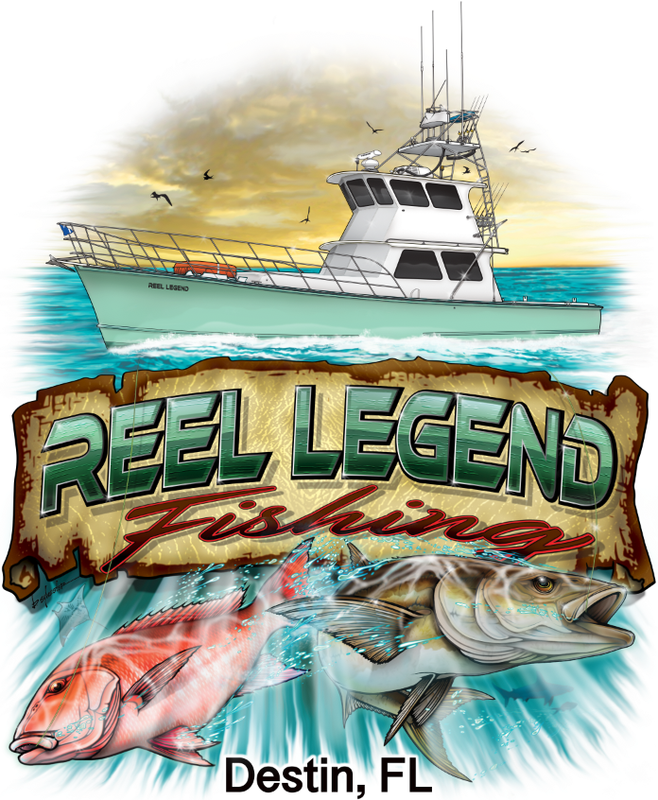 This logo was to be a 3 fish illustration including a tarpon, redfish and trout. Adding baitfish and a background scenes also made it into the plan.